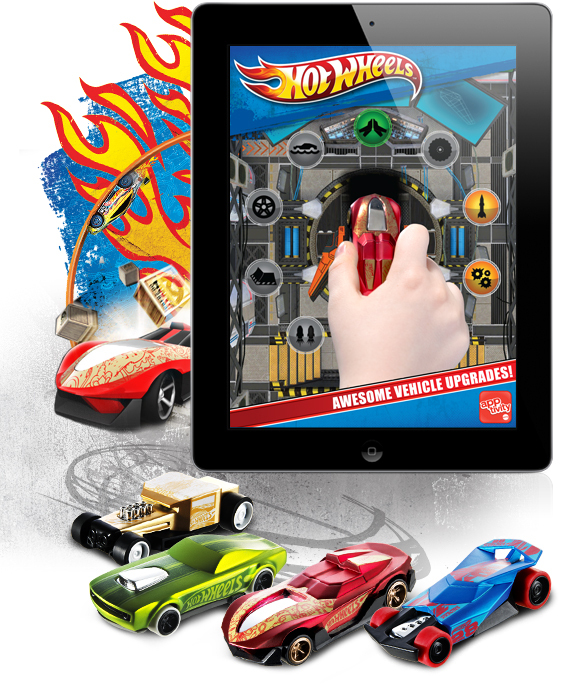 Apptivity is a brand new idea from Mattel that allows kids to play with their favourite toys on the iPad. When I was asked if I would like to review the Hot Wheels version of Apptivity I jumped at the chance. My boys love both playing on the iPad and with Hot Wheels so this seemed like a great idea. The idea is simple, first purchase a compatible Apptivity toy (in our case a small blue car) then download the free app. When the car is placed onto the iPad screen it interacts with the app using patented conductive technology. Simply put, you swivel the car on the screen to drive along the track. I was rather apprehensive about allowing a toy to be placed onto the iPad screen, I was concerned about scratches. So far though I’m happy to report that none have appeared, although I did keep an eye that the boys didn’t press too hard. The actual app looks very impressive, it’s graphics and content are excellent for a free game. However I suspect this was also it’s initial downfall, on an original iPad it crashes on a regular basis before you can actual do an awful lot. The iPad 2 seems capable of handling the game, but this isn’t made entirely obvious on the toy or app. I also fear that my boys were a little too young for the game, even with my game savvy brother sitting with us we all got a little confused as to what we were actually supposed to be doing. It would have been much more fun if they had simplified the games to just basic races as far as we were concerned. This all sounds rather negative and I must admit that I wasn’t overly impressed with the game. However my sons would tell a vastly different story. Despite some crashes, confusion and general head tapping they absolutely adore this game and ask to play with it often. They are much more forgiving of the little niggles which would stop me from playing. They don’t care because at the end of the day they get to play with a car on the iPad with cool music and great visual effects, it’s a boys dream. As a parent you may find yourself slightly disappointed for the points I mentioned, but Mattel know their market and the child you buy it for is quite likely to be thrilled. I obviously can’t comment on the other incarnations of Apptivity. The range brings to life some of the UK’s hottest toy brands including Hot Wheels, Batman and WWE as well as extending the play value of top-selling apps such as Angry Birds, Cut The Rope and Fruit Ninja. And it’s great for all the family – there’s even an Apptivity toy for toddlers. Single Apptivity packs start at RRP £11.99. There are also larger starter packs priced at RRP £24.99, which come with exclusive figures, amplifiers and accessories.